Teach and learn grammar the easy way. I want to teach grammar and diagramming to beginners. I want to learn grammar and diagramming, and I'm a beginner. 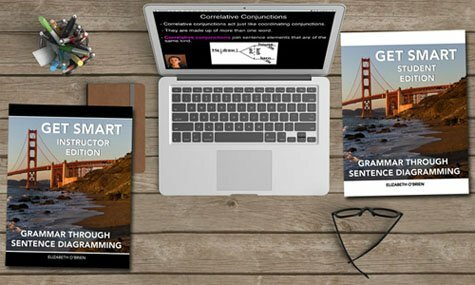 Teach or learn grammar and sentence diagramming with these videos, written lessons, and exercises. 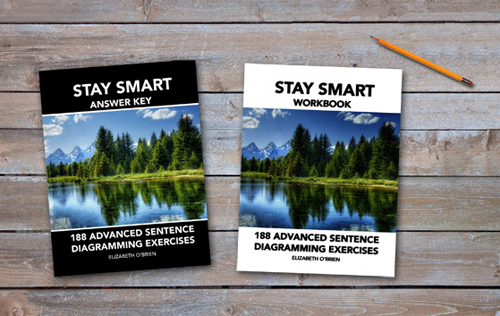 You don't need to know any grammar to get started with this program. 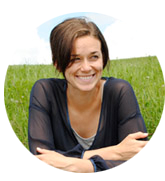 You get lifetime digital access to the videos, lessons, and exercises. Learn more and see samples here. The school version includes a username and password for students to access the student materials online. Prices are per teacher for the length of the teacher's career. My students need to review grammar and learn sentence diagramming. I need a grammar refresher, and I'd like to learn sentence diagramming. 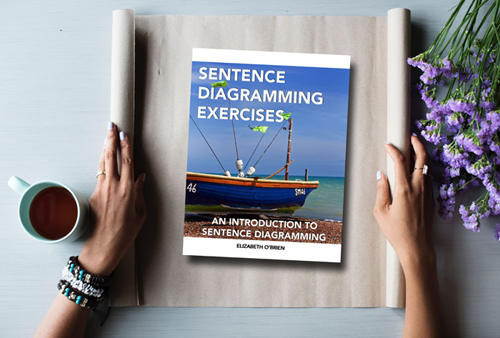 This book of sentence diagramming exercises gives you an introduction to sentence diagramming. You'll get a grammar refresher and learn how to diagram sentences. 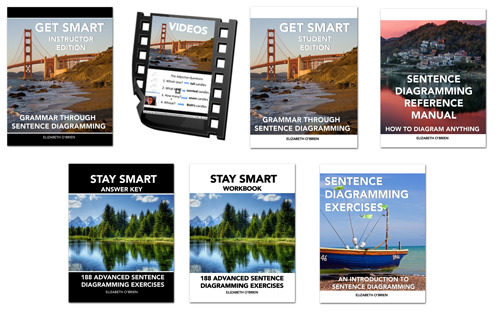 It includes short lessons and sentence diagramming exercises that start with the basics. My students already understand grammar and know how to diagram sentences. I'd like something that will help them keep their skills sharp. I already know grammar and diagramming, and I'd like to keep my skills sharp. Keep your grammar and sentence diagramming skills sharp. You'll find 188 interesting sentences to diagram. The workbook leaves space to write answers, and the answer key contains all of the answers! I'd like a quick way to look up grammar terms and sentence diagramming structures. 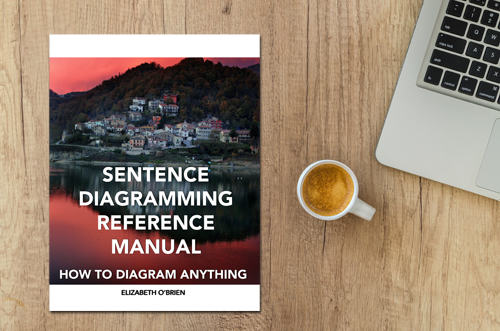 This reference tool will make sure that you always know how to structure your sentence diagrams. It gives you short, simple explanations and easy-to-use diagrams of everything you could want to diagram, and it is organized in alphabetical order. These posters will be beautiful learning tools for your classroom walls. Each color-coded poster focuses on one of the eight parts of speech. You'll receive nine 8" x 10" images that you can print out and add to your walls. 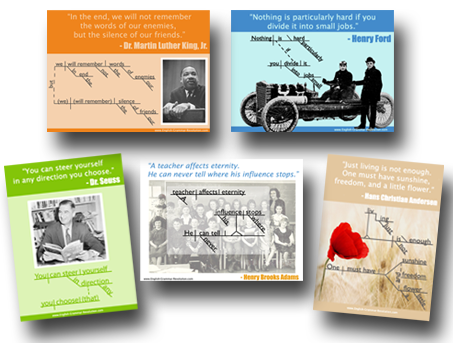 Decorate your classroom walls with these colorful, inspirational quotations that are also diagrammed. You'll receive five 8" x 10" images that you can print out and add to your walls. This movie will change the way you think about grammar. Join David and Elizabeth O'Brien as they travel around the country and explore the world of grammar and grammar instruction. Featuring Noam Chomsky, Bryan Garner, Grammar Girl, Steven Pinker, and more! Why is grammar a controversial subject? Why has it faded out of many schools? 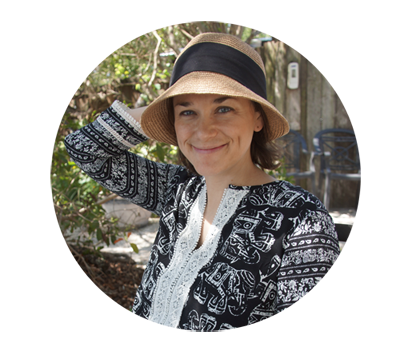 Hear from teachers, students, grammarians, CEOs, and linguists, and discover why grammar is an important subject that needs to be reconsidered, reconceived, and revived. "...more comprehensive, thought-provoking, and inspiring than I could have ever imagined." "If you have any interest in language, education, or the state of today's culture, I think you'll find this documentary insightful and inspiring!" We are committed to helping you learn and love grammar. We don't like receiving money from people who are not happy with what they get. That's why we offer a 30-day guarantee on all books and courses. If, after having your books or courses for 30 days, you are not happy with them for any reason, we'll pay you back. Contact us, and we'll refund 100% of your Grammar Revolution payment. Posters and documentary sales are non-refundable. I look forward to helping you learn and love grammar. I used your program with my eighth grade students, and they topped out with the highest ELA scores in the district. Thank you, Elizabeth. My students, by the way, also adore your program! I love your program!! I am using the videos to help teach my students note taking strategies as well. It has been fun to watch them grow in confidence in grammar and note taking! We used your sentence diagramming program last year, and my son LOVED it. I am a TESOL instructor, and although I know when a sentence isn't right, I couldn't explain why. Teaching grammar was my biggest fear about starting this career. You have helped so much in reducing that fear! I am loving the Get Smart program! My eighth graders are grasping grammar better than I've ever seen. I intend to continue using this every year! I really want to thank you so much for all of your help! I'm learning so much that I'm smiling and feeling confident in myself now. I'm beginning to believe that anything is possible. We ordered all of your books, and we are loving them! My 12 year old son is racing through the lessons in the Get Smart program. He loves sentence diagramming. Thanks for making grammar fun and interesting. Thank you for the wonderful way in which you teach this material. Everyone is enjoying it, having fun, and learning at the same time. Yeah! I gave my regular ESL class yesterday, and I knew how to answer a question about dependent clauses and another about participles being used as adjectives. This was in my more advanced class. Hurray! Thanks. Our family continues to enjoy your grammar program, and I am so thankful for such a fun and interesting way to learn grammar. Thank you! My boys are really understanding grammar this year. It's helping them so much with writing correct sentences in all of their other subjects. I am teaching a grammar class using your curriculum, and I'm loving it! The kids are doing so well, and I'm learning a bunch too! Thank you so much for your curriculum! I went to school in England, and we never learned sentence diagramming. It has been one of the best discoveries of my writing life. Prior to using your program, grammar confounded me. I'm so grateful for your lessons. that I've seen. My kids get a big kick out of showing their work on the Smartboard. I just recently purchased the home-based Get Smart program. I wanted to check it out to see if it would be a good thing for me and I love it! I have never diagrammed sentences before and it's quite a bit of fun. learn with, I never imagined it could be this interesting. I just wanted to take a minute to tell you how great your program is. My boys are 9 and 11 and they never complain to do their grammar home study because they LOVE you so much! They enjoy your videos and are "getting it". They are really "getting it"! I am working through your e book and it is absolutely fantastic. My kids and I love your materials! Your Get Smart diagramming course has truly revolutionized grammar learning for my kids. Thank you again for writing an awesome curriculum that makes grammar easy to grasp and fun at the same time.